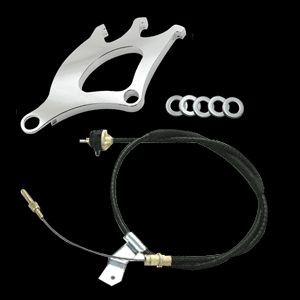 UPR's Adjustable Clutch Cable and Quadrant Kit is the ultimate package for your 79-95 Mustang. Includes our Triple hook quadrant that was recently redesigned with a new radius that decreases pedal effort by 20%. Plus you also get our adjustable Clutch Cable, which features low friction liner and Heavy Duty stainless steel wire. Installs in 30 minutes or less with simple hand tools in the factory holes. 1979 1980 1981 1982 1983 1984 1985 1986 1987 1988 1989 1990 1991 1992 1993 1994 1995 V8 GT GTS Cobra Mustang Steeda Roush & Saleen Vehicles. No one else can stack up to the bold clean styling of our aftermarket Billet dress ups, Street Strip & Racing Suspension & Performance Parts for your late model American Muscle Car!